Jeremy Hotz totally stole my joke this evening. Well, “beat me to the punch(line)” is more accurate. 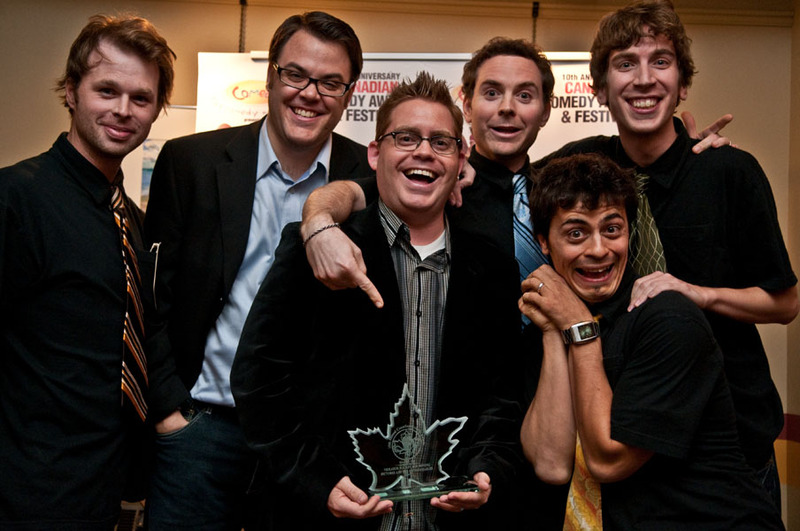 While accepting the Canadian Comedy Award for best male stand-up – he quipped something along the lines of: “Oh great, not winning a Canadian Comedy Award was all that kept me going. Not having one of these was all that got me out of bed each day.” While maybe not quite the same, the RocketAce/Imponderables super-group was racking up an impressive run of nominations for best web video without ever winning the thing (five, last time I checked). I was looking forward to adding to that tally – so I could continue to come up with tortured press release statements such as “Rocket Ace Moving Pictures has been nominated for more Canadian Comedy Awards (in Internet-based comedy) than anyone in history” – all the while avoiding broaching the fact we’d never been able to seal the deal. Anyway – that’s all done now – whatever will we do now? Seriously – my sincerest thanks to the incredible RocketAce team (especially Matt, Erin, and Jay) and all the Imp’s. It’s not often you get anything for Internet-based comedy (other than a stack of YouTube commentors saying some questionable things about your mother… which… this is entirely different).